﻿I like old trucks. Maybe it stems from my brother’s old truck that got us started wrenching on stuff? 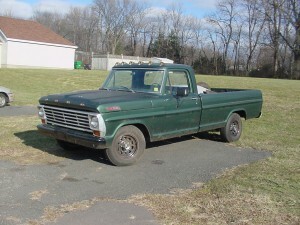 So when a friend of mine wanted to get rid of his 67 F100 in a hurry I was more than happy to oblige. I just purchased a piece of land in which I was going to build a house on….the perfect justification for a tough old truck. The problem was at the time I was living in a condo complex. Eventually, my wife’s embarrassment of having it sit in the condo parking area for everyone to see reached a level in which she gave me enough hell to prompt me to unload it…..I should have never sold it. It was very solid, someone already re-did the body at some point. The interior was mint. The engine ran smooth and the cab was really tight. The only silver lining is that the guy who bought it was a really interesting car guy. He actually hosts a automotive themed radio show. He had a collection of old fords including a Torino, Ranchero, Falcon wagon, and Cougar. So basically, I finagled into the ‘deal’ that I would personally deliver an extra windshield I had for the truck to his house….provided he showed me his other rides. I spent a while at his house and he traded car stories for a bit. His pride and joy was his Torino (white with blue C-stripes if I remember correctly) and he was active in the Torino enthusiasts community. He bought the Torino on the west coast and attempted to drive it back to Connecticut via Route 66…..I think he said he ran into issues midway and let AAA take care of the rest of the trip. It’s a shame that you had to let go of it before you even got started to try to bring it back to its glory. But at the same time, you were lucky to have found a buyer who would put his all into restoring it. 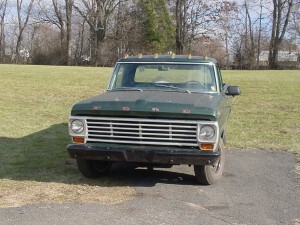 Given his track record, I’m sure that old Ford truck is one beautiful machine, or on its way to being one again.